The Bavaria Israel Partnership Accelerator (BIPA) officially opened for business at WERK1 in Munich on September 8. The program supports innovative digitization projects and is designed to help cultivate sustainable economic ties between Bavaria and Israel. The audience pays close attention as the BIPA is opened at WERK1. From 2015 through 2017, the BIPA will be organized and operated by the Strascheg Center for Entrepreneurship at the Munich University of Applied Sciences and the FOM University of Applied Sciences in cooperation with the Tel Aviv-Yaffo Academic College and StartHub. 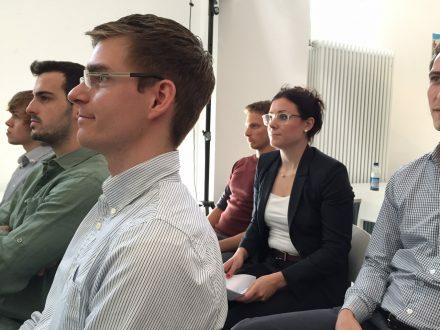 Munich’s Department of Labor and Economic Development will join with other partners such as the Federal Foreign Office, the Goethe Institute, startup ecosystem WERK1 and the 4Entrepreneurship think tank (which is backed by several Munich universities) in supporting the first edition workshop in 2015. The accelerator’s media partner is Munich Startup, the official startup portal for Munich. For more information about the agenda and opportunities to get involved, please visit http://bip-accelerator.com and http://www.sce.de.